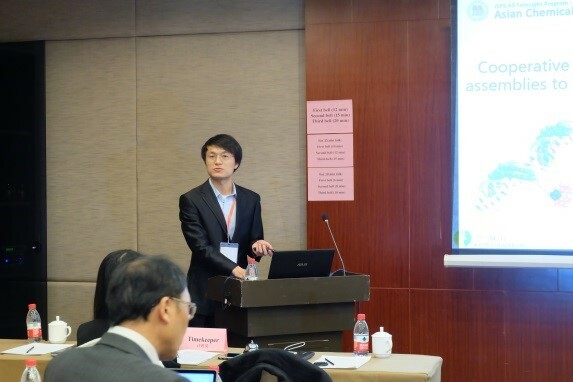 It was my great honor to attend the Second A3 Roundtable Meeting on Chemical Probe Research Hub which held from Nov. 23rd to 26th in 2017 in Hangzhou, China. A3 program is special. It combines famous professors from three countries (Korea, China, and Japan) perfectly, roundtable scale meeting provides substantial chances for every attendees to know each other well, and attentively meeting-organization makes everyone feel sanctification. I am a lucky guy! As a Chinese who pursuing PhD degree in Japan, I cherished this special opportunity to be a member of Japan researchers’ group (21 Professors and 4 PhD students). During the meeting, I have tried my best to do several things. First and foremost, I shared our latest research on tackling challenging issues by programmable DNA binder. The title is “Cooperative DNA recognition by artificial assemblies to mimic transcription factor pair”. Cooperation between pairs of transcription factors (TFs) has been widely demonstrated to play a pivotal role in the spatiotemporal regulation of gene expression, but blocking cooperative TF pair–DNA interactions synergistically has been challenging. In the oral presentation, I introduced the design of DNA binder pyrrole-imidazole polyamides conjugated to host–guest assemblies (Pip-HoGu) which mimic the cooperation between natural TF pairs. Moreover, the experimental results from both in vitro and in cell-based assay were shared with the attendees. The acknowledgments and valuable comments from scientists, such as Prof. Naoki Sugimoto, encouraged me to persist in this fantastic research fields. Secondly, scientists from abroad but inter-connected research backgrounds introduced us fantastic scientific ideas. It was a great chance to enhance my knowledge on discovery and chemical synthesis of natural products, versatile fluorophore probes, disease models in lab, nucleic acid structure and binders, etc… Learning from others help we know our needs, and that might plant the seeds of collaborative works. Everyone in A3 meeting might anticipate the combination of one scientific question, probe design, chemical synthesis, technology, and disease model. Another reason why A3 meeting provided the chance for collaboration was that, it offered us plenty of chances to talk with each other and make friendship. During the stay in Hangzhou, I could spend more time to stay together with three PhD candidate teamers, and also create friendship with students from Korea and China. We are now in the same period of our research career and we are all energetically prepared to fight together with the any potential challenges. Meeting with scientists was a great experience. Currently, I am not totally determined about my next plan after PhD course. Here, A3 meeting gave me a good chance to ask for suggestions from predecessors who also shared and understood my confusions. I would like to express my deepest gratitude again to Prof. Ueda and all A3 organizers. This was the first time to attend A3 meeting as young scientist representative, and I hope that, through my continuous hardworking, I could make my contribution to A3 meeting in the near future.